Gooner.com: When Does A Draw Feel Like A Loss And A Win? When Does A Draw Feel Like A Loss And A Win? Damn but didn't we have two real prizefighters out there on the Emirates pitch today, or what!? Win, lose or draw, normally my first inclination goes with shredding the Chelski brand, or coming up with ways how I know Mourinho makes the world more evil and soulless. Of all the EPL teams, I despise these Blues most. More than Spuds or Manure, or even Jerry Jones <shiver>. Okay, he's not affiliated with soccer -- and that is evidence of a higher intelligence being in control -- I'm just saying Abramovich, Jones, and the Special One will surely share a cell in hell where each moment of their eternal suffering will transform into a raindrop of puppy breath until all the world's orphans can bathe in monsoons of joyous laughter while knowing that the world will finally experience peace and everlasting harmony. Whoops, there I went with my usual first inclination, again. Oh well, on to the breakdown. Hazard, in anticipation of his inevitable POTY award, must have been on the train to the ceremony during the game, because I hardly heard Arlo White utter his name. Prior to the match, I wondered whether Wenger would opt for the experienced Debuchy or for speed and sheer tyranny of youthful desire with Bellerin. He gambled on the young Spaniard, and the Belgian promptly evaporated into the London Underground. In the American market, a nil-nil result, especially on phone apps and tv highlights, lend to a lackluster response from the mainstream public. But I wore off the edge of my seat by the middle of the first half. Not because of all the chances that either side created. Not because of the box-to-box gliding runs by the army of deft-footed midfielders showcased in both blue and red. Not because of the spectacular diving saves by the world-class keepers in either end. None of this happened. In fact, nothing of the usual beauty that endears me to this sport was on display today. Just two simple heavyweights, battling it out, punch after heavy punch, to go the distance. To my surprise, the usually-parked busses slipped into higher gears and turned the London derby into a churning demolition derby, leaving a wake of leggy and exhausted players strewn about like dying jellyfish on the shoreline after the tide ebbs away. Exhausting to watch as a spectator. Agonizing to experience as a fan. I wouldn't want to know how the players felt. With still a game in hand, this single point leaves the Gunners in third on goal differential behind the Citizens, and couple points ahead of the Red Devils, thus still in a decent position to retake second. This draw is a win. Battling the top team to a scoreless draw, when they have only had one other game in which they did not score a goal. This draw is a win. Proving that The Arsenal now play against the top four with solid determination and desire to win, rather than hoping not to lose. This draw is a win. But this was not a win. Wenger still needs Mourinho's evil head on his wall. 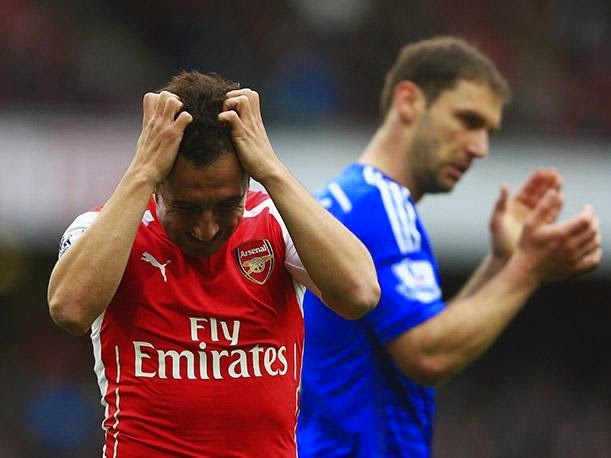 In almost every aspect of the game, Arsenal were as good as Chelsea. Nearly every aspect, except the defense. Ours was solid (remember Bellerin-Hazard? ), only making a handful of mistakes. Chelsea were better, making essentially none. John Terry was a brute on the field, just as much as off. Neither keeper was really tested; the midfielders came out par, and the final attack was the same. Which is to say they had no real attack, with Costa out and Drogba being, well, eligible for my Over-40 league, soon. And the brotherhood of Giroud-Ramsey-Ozil-Alexis simply could not penetrate the EPL's best defense. Mostly this was loss because it was not a win. We didn't need the win to finish top. We didn't need the win to prove we were good. We didn't even need the win to end up 2nd. We just needed that monkey-removing win to club that smug smirk from Mourinho's face. Here's to a week's much-needed rest before Hull City, and the final run-in. COYG!